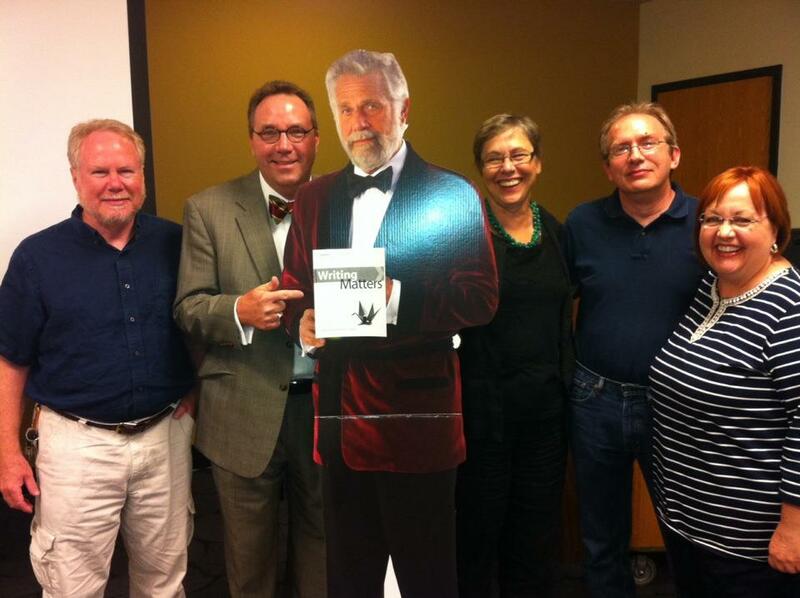 The Most Interesting Man in the World (and, to his left, Rebecca Moore Howard, author of Writing Matters) came to visit our department meeting one day. I have been teaching for over 20 years now, but only within the past couple of years do I feel that I have been designing writing prompts for shorter papers and longer, research-oriented projects that reflect what I think are important skills for students to acquire and practice. Here in this space, then, I want first to do a little narrating/philosophizing to provide some context for the assignments you see below. For as long as I can remember, my teaching has been driven by two impulses: 1) I am fascinated by ideas and concepts, and I think there is real value in having students engage with them, even if only playfully in classroom discussions (one example: by way of introducing argument in our Comp I class (which is oriented toward teaching the rhetorical modes), I ask students to think about their definition of “reality” and then make the case that someone or some object in the classroom is “real”–this allows us to talk a little about competing epistemological schools of thought), but also, of course, more substantively in their writing; 2) I want, whenever possible, for students to have the sense that they have genuinely learned something: Not just factual information, but also that much more profound intangible of students’ seeing how their thinking about something evolves as they read and then attempt to write about what they have read. As you know or suspect, neither of these impulses exactly marches in lock-step with current received truths about our students, how our teaching should in some way respond to those received truths, or assumptions at the community, state, or federal levels about what students “should” be learning in community colleges. The result of all of this was that, as the years passed, I grew more and more dissatisfied by messages that our in-service speakers had been telling us about meeting students where they were via their shortened attention spans and their devices (Wait, I’d say to myself: What about encouraging/prodding/compelling students to meet us where we are? It’s called “pursuing an education” for a reason, isn’t it? ), and more and more dissatisfied with my own felt inability to come up with shorter assignments for Comp I that amounted to little more than reflection papers, or assignments for research papers that weren’t glorified reports on subjects on which students already had fixed opinions. Then a couple of years ago, an academic dean from the University of Guelph in Canada came to talk to us at in-service. He began by giving the usual profile of millennials, but then he described his university’s first-year-student experience for some of its divisions, which in just about every way conceivable works against those traits. Students are assigned to groups and are given a scenario in which they are given a problem to solve and are assigned a role to play out of which they address that problem. His school has not only been pleased with the data which show those students to be more academically successful than students who have not gone through that experience, they also want this to be implemented throughout the university. He was discussing inquiry-based learning. As I listened, a great light dawned in me. Yes, I said, almost Molly Bloom-like: This is how to marry those impulses of mine. Since that time, then, I have slowly been discarding assignments that result in perfunctory papers and replacing them with assignments that attempt to spur genuine thought and, when possible, get students to do some outside reading and thinking on topics that either are unfamiliar to them (such as assignments that ask students to think about the concept of “place”) or, paradoxically, are so familiar that they hadn’t really given them much thought before (such as prompts that ask students to think about how technology affects modes of thinking, working, and engaging with other people). What you’ll see in these files, then, are assignments that, with some exceptions, fit those goals. I’ve also included some talks that I’ve given to my colleagues regarding two assignments/activities that make use of film (another medium that students are very familiar with but tend not to think about too deeply). You are more than welcome to borrow from these, if you are so inclined; I hope you will leave comments if you should find any of them especially useful. You’ll note a two-talk fixation with using films in class in different and, I hope, thought-provoking ways. I am interested in other things besides that topic, but I have yet to work up talks on them. You will see some overlap between/among these round-ups of writing prompts, just so you know. At Butler Community College, Comp II is “the research paper class,” with a bit of literary or film analysis thrown in. What I have here so far are two assignments. The scenarios for the research essay were inspired by the inquiry-based learning talk I mentioned above; these are the current ones, but I hope soon to retire some of them and come up with some new ones. I’ve also included a film analysis paper assignment, which often yields good, thoughtful papers. The only real reasons these films are on the list are 1) They are the sorts of films that invite, and hold up to, repeated viewings; 2) I know these films fairly well, which speeds up the reading and commenting process when it comes to paper-grading time. The other paper assignments in this class are a rhetorical analysis of a piece of writing, an annotated bibliography, and a persuasive essay based on the students’ research projects. They are pretty standard fare, in that, with the exception of the rhetorical analysis, they are tied in different ways to the research essay. They aren’t especially “interesting,” which is why they aren’t here, but they do seem to help keep students on task. How much, or how little, would you say you use the textbooks that students are required to buy. I often feel constrained by balancing how much the students paid, vs. how much I refer the students to them. I think that guilt keeps my assignments from being more interesting. I did have such a brainstorm this morning while out on my walk, that I may push my retirement date further into the future! Freda, thanks for dropping by, and thank you for the very kind words. I suppose the way to characterize how I use the texts is that I use them as starting points. I assign a fair amount of reading in them in both comp classes, and we discuss what they’ve been assigned, but then I try to come up with writing assignments that take the students out of the books a bit. As I mentioned in that preamble up there, I try to come up with assignments that bring them into contact either with ideas that are probably new to them, or with ways of looking at things that are so familiar to them that they don’t give those things much thought. The selections of readings in Practical Argument are fine, as far as they go, and I’ve had some good luck with discussions of some of them, but (my personal opinion) many of them are on fairly familiar topics, even if they are important. So, I try to broaden the ol’ intellectual palate whenever I can, but not to the point that I have trouble justifying to myself or to them the value of having the book. Your brainstorming session reminds me that there’s something I want to do with some of the essays and books on the philosophy of walking that have been coming out in the past few years. What exactly that something will be, I don’t know yet . . .